I always get bitin when I munch on those mouth-watering buffalo wings at places like Chili’s or Fridays. Each serving usually has six to eight wing pieces. Why, it posesses the ‘mahirap tigilan kainin‘ effect similar to when you eat butong pakwan or chicharon balat. And, going for seconds would mean whipping out another P400 (or thereabouts) from your wallet. Tsk, so that’s P800 plus for the 16 precious wings. Over at the grocery, 16 pieces would only cost you P300 or less. So, there. Now, the point: MAKE YOUR OWN! Buffalo wings originated from Buffalo in New York. It is famous for its taste, degree of ‘hotness’ and the blue cheese dip that traditionally goes with it. It’s very definitive of American dining especially among ‘clubbers’ who wolf these wings down while drinking some beer. In our native language, we refer to this buffalo wing dish as the perfect pulutan. Its spicy nature makes these drinkers drink more to numb the throat and mouth-tingling sensation caused by the spices. This dish can be made in two ways: baked or deep-fried. I prefer the latter. While the former advocates health benefits (since it does away with cooking in oil), the later yields a better texture, appearance and taste. 1. Season chicken with salt and pepper. Add hot sauce, butter, cayenne pepper, paprika and worcestershire sauce. Marinate for an hour. 3. Meantime, in a separate skillet, heat 1/4 cup oil. Pour chicken marinade. Stir in chicken. Serve hot with dip. 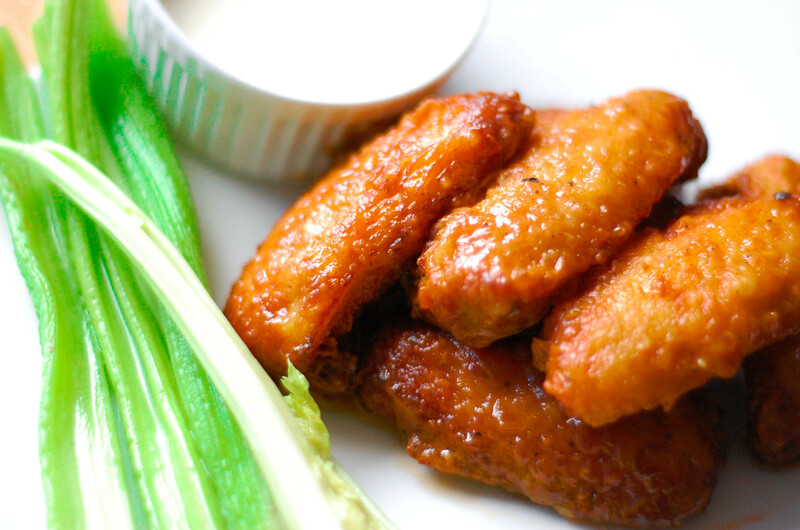 Traditionally, buffalo wings are served with blue cheese dressing. I did not have blue cheese when I cooked this today and so I settled for the next best thing, garlic-cream cheese dip. 1. In a processor, blend in all ingredients until smooth in consistency. SERVE WINGS WITH CELERY STICKS. Hi Caren, I love chicken wings too. The original Buffalo chicken wings consists only of melted, salted butter mixed with Frank’s RedHot sauce. Once the wings come out of the deep fryer – season with salt and pepper then put them in a plastic container with a lid – add the butter-hot sauce mixture, put the lid – make sure you have a good seal and then shake until well coated. Cayene powder will do but using Frank’s RedHot sauce has that fermented cayenne pepper taste not to mention other condiments added to it i.e. vinegar etc. waaah. the dip! the dip! that alone is ulam already! haha thanks friend.